2T. 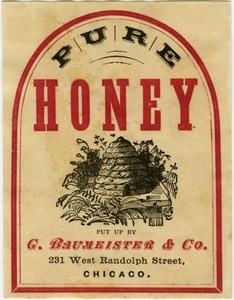 S. Doremus & Co.
Chicago (Ill.) - Label for jar of honey by Chicago honey firm. 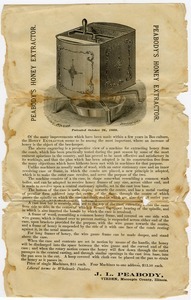 Virden (Ill.) - Advertising for honey extractor; includes illustration of perspective view of the extractor, patented in 1869. T. S. Doremus & Co. 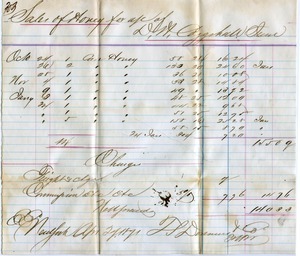 Sales of honey for a/c of D. H. Coggeshall, Jr.
New York (N.Y.) - Accounts for sale of $140.33 of honey produced by Coggeshall. 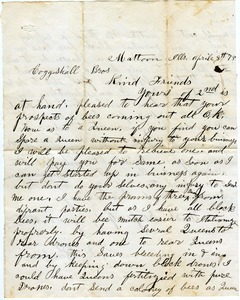 Account enclosed in letter from Doremus to Coggeshall, 1871 Apr. 28 (mums600-f007-i001-001). 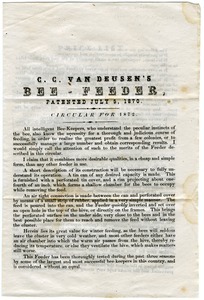 Advertising for bee feeder for "All intelligent Bee-Keepers;" includes two small illustrations. 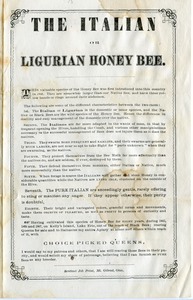 Circular of Italian bees, imported queens, colonies, comb foundation, extractors, etc. Hamilton (Ill.) - Catalog and price list for bees and beekeeping supplies, including queens, comb foundation, hives, tin pails, extractors, honey knives, bee-veils, jars, uncapping cans, smokers, and saws. Rochester (N.Y.) - Advertising for sales of individual or territorial rights to Langstroth's moveable comb hive, including testimonials, references, and promotion of bee-keeping for ladies; illustrations of bees, the hive and frames, a bee hat, and Langstroth holding a comb. 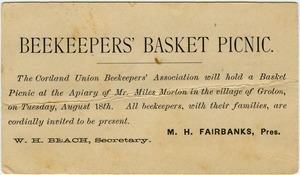 Cortland (N.Y.) - Invitation to beekeepers' picnic at the apiary of Miles Morton (Groton, N.Y.); signed by M. H. Fairbanks (Pres.) and W. H. Beach (Sec.). 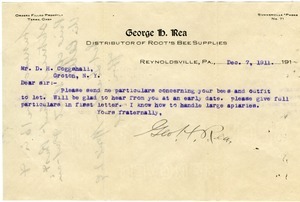 Pennsylvania - Request for information on renting bee from "Distributor of Root's bee supplies"; "I know how to handle large apiaries." Mt. 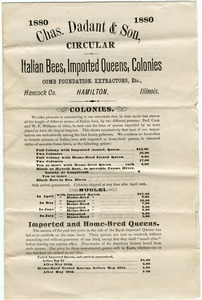 Gilead (Ohio) - Advertisement for sale of Italian bees, first introduced to the United Sates in 1860, with instructions for introducing queens to black bees and advertisements (and partial price list) for frame bee hives, stock, poultry, and seeds. Sold by Aaron Benedict, Morrow Co., Ohio.